A clamor for justice to be served for the perpetrators of the alleged killing of Jessa Rose Bigayan earlier this week has reached social media. BICOL STANDARD received this open letter addressed to the mayor of Naga City, the Naga City Police, SM Naga, and other concerned citizens. We are publishing the letter in full. We cannot begin to imagine the continued pain and suffering endured by Jessa Rose Bigayan's family and friends. We stand in solidarity with them as they continue to fight for justice, civil rights and closure. And we will thank everyone who are pushing and will continue to push for justice. 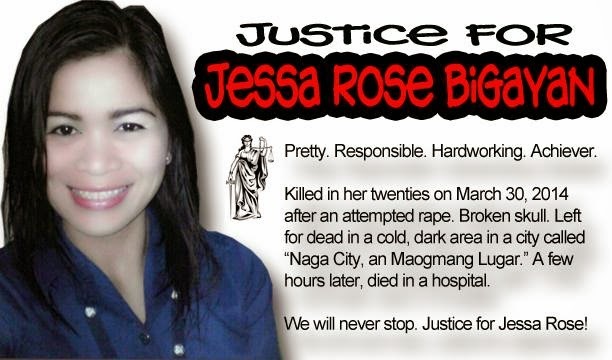 Jessa Rose Bigayan deserves justice and her civil rights. We support the very few individuals who are urging the local government of Naga and the Chief of Police to explore every possible option to ensure that justice is served for Jessa Rose and that her civil rights are honored and respected. But our work does not end there: we will honor Jessa Rose by strengthening our commitment to stopping violence against women, hatred, and violence across our communities. We represent a community that has not been insulated from these as we have members who at some point in their lives and some have persisted today these kinds of cruelty, both here and abroad. Every person must be able to walk the streets without fear for their safety, especially those hard working laborers who take up long hours and go home late like Jessa Rose who worked as an OIC at the SM Naga. We call out SM Naga to consider doubly their care of their employees especially women who are victims of senseless acts related to their jobs. Honor your people SM Naga by providing them with safety measures especially the women when they go home late from work. We call out the local police to hasten the investigation. Your vision until 2030 is “We shall be a highly capable, effective and credible police service working in partnership with a responsive community towards the attainment of a safer place to live, work and do business.” Your mission is to “enforce the law, prevent and control crimes, maintain peace and order, and ensure public safety and internal security with the active support of the community.” You have our support: please continue to enforce. We call out the LGU under the leadership of Mayor John Bongat. One of your objectives in DILG is “Sustain peace and order condition and ensure public safety.” This is a public safety issue that cuts across the rights of the poor and violence against women and the City’s peace and order situation. The whole of Bicol region looks up to Naga City as the center of a lot of things like public safety. Again, every person must be able to walk the streets without fear for their safety. Justice delayed is justice denied and in the words of Dr. Martin Luther King Jr. "a right delayed is a right denied." We honor Jessa Rose by seeking justice for all people.